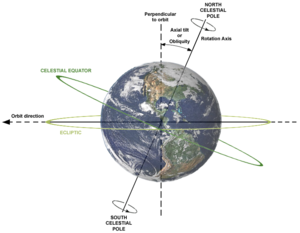 The celestial equator is inclined bi 23.5° tae the ecliptic plane. The image shaws the relations atween Yird's axial tilt (or obliquity), rotation axis an plane o orbit. The celestial equator is a great circle on the imaginary celestial sphere, in the same plane as the Yird's equator. In ither wirds, it is a projection o the terrestrial equator oot intae space. As a result o the Yird's axial tilt, the celestial equator is inclined bi 23.4° wi respect tae the ecliptic plane. An observer staundin on the Yird's equator veesualizes the celestial equator as a semicircle passin directly owerheid through the zenith. As the observer moves north (or sooth), the celestial equator tilts taewards the opposite horizon. The celestial equator is defined te be infinitely distant (syne it is on the celestial sphere); thus the observer always sees the ends o the semicircle disappear ower the horizon exactly due east an due wast, regardless o the observer's position on Yird. (At the poles, tho, the celestial equator would be parallel tae the horizon.) At aw latitudes the celestial equator appears perfectly straicht acause the observer is anly finitely far frae the plane o the celestial equator but infinitely far frae the celestial equator itself. ↑ "Celestial Equator". Retrieved 5 August 2011. ↑ Millar, William (2006). The Amateur Astronomer's Introduction to the Celestial Sphere. Cambridge University Press. ISBN 978-0-521-67123-1. This page wis last eeditit on 26 October 2013, at 22:08.